a Faculty Adventist of Hortol? ?ndia (UNASP). Hortol??ndia. S? ?o Paulo. Brazil. Human Performance Research Group- Master in Physical Education. College of Helth Science. Methodist University of Piracicaba (UNIMEP). Piracicaba. S? ?o Paulo. Brazil. b Human Performance Research Group- Master in Physical Education. College of Helth Science. Methodist University of Piracicaba (UNIMEP). Piracicaba. S? ?o Paulo. Brazil. c Faculty Adventist of Hortol? ?ndia (UNASP). Hortol??ndia. S? ?o Paulo. Brazil. d Departament of Sport Sciences. Federal University of Tri? ?ngulo Mineiro (UFTM). Uberaba. Minas Gerais. Brazil. Objetivo. Comparar la influencia de las velocidades de contracción lenta y rápida en el volumen total de carga levantada en una sesión de entrenamiento de resistencia con ejercicios de pesos libres para miembros superiores, y analizar el tiempo de recuperación de la fuerza máxima del músculo después del ejercicio en la resistencia de hombres entrenados. Métodos. Dieciséis hombres jóvenes que tenían experiencia en el entrenamiento de la resistencia fueron divididos aleatoriamente en dos grupos: la velocidad de contracción rápida (FCV - n = 8) y la velocidad de contracción lenta (SCV - n = 8). Ambos grupos realizaron el ejercicio de press de banca y press banca inclinado (pesos libres) con 4 series de 12 repeticiones máximo; y un intervalo de 50 segundos de descanso entre cada serie y 2 minutos entre los ejercicios. La velocidad de contracción fue de 6 segundos para el grupo SCV y 1,5 segundos para el grupo de FCV. El volumen total de carga fue anotado durante la sesión de ejercicio; y una repetición máxima (1RM) fue evaluada antes (basal) y durante 96 horas después del ejercicio para medir la función neuromuscular. Resultados. Los resultados demostraron que el grupo de FCV proporcionó un mayor (p < 0,05) volumen de carga levantada durante la sesión de ejercicio, y tuvo una disminución significativa (p < 0,05) en el rendimiento neuromuscular después del ejercicio, en comparación con el grupo SCV. Conclusión. Estos datos sugieren que además de la velocidad de contracción, el volumen total de carga elevada determina la disminución de la función neuromuscular después del ejercicio en la resistencia de hombres entrenados. Objective. To compare the influence of slow and fast contraction velocities in the total volume of load lifted in a resistance training bout with free weights exercises for upper limbs, and analyze the recovery time of the maximum muscle strength post-exercise in resistance-trained men. Methods. Sixteen young men, who were experienced in resistance training were randomly divided into two groups: fast contraction velocity (FCV - n = 8) and slow contraction velocity (SCV - n = 8). Both groups performed bench press and incline bench press exercises (free weights) with 4 sets of 12 repetitions maximum. There was a 50 seconds rest interval between each set, and 2 minutes interval between the exercises. The contraction velocity was 6 seconds for the SCV group and 1.5 seconds for the FCV group. The total volume of load was recorded during the exercise bout, and the one repetition maximum (1RM) was evaluated before (baseline) and for 96 hours after exercise to measure the neuromuscular function. Results. The results demonstrated that the FCV group provide a higher (p < 0.05) volume of load lifted during the exercise bout, and had a significant decline (p < 0.05) in the neuromuscular performance post-exercise, when compared to the SCV group. Conclusion. These data suggest that besides the contraction velocity, the total volume of load lifted determines the decline of neuromuscular function post-exercise in resistance-trained men. Resistance training is known as an effective method to enhance neuromuscular capacity. It is greatly used by various populations in order to increase the levels of strength, power and muscular hypertrophy1,2. The magnitude of adaptive responses in the continuous process of training depends on how the acute variables are manipulated, which include: muscle action, intensity, volume, choice and order of exercises, rest interval between sets and exercise, contraction velocity and weekly frequency3,4. The impact of a resistance training bout of high intensity and/or volume resistance exercise results in muscle damage caused by metabolic and mechanical factors5,6. From functional point view, the muscle damage can cause alterations in neuromuscular function, as the decrease in maximal voluntary contraction post-exercise bout7-10. However, when recovery times between bouts are inadequate for an extended period of time, they may contribute to a substantial decline in muscular performance and may also induce an overtraining state11,12. For this reason, studies investigating the influence of the manipulation in training variables on muscle performance, contribute to the prescription and elaboration of more efficient strategies for the development of training programs with appropriate recovery time. Among the factors mentioned above, the contraction velocity may influence the magnitude of muscle damage and decline in neuromuscular function. However, this relation is not clear since there are studies that indicate greater muscle damage in fast movement velocity8,13,14, and other studies do not corroborate with these results15,16. However, these studies reported uses isokinetic dynamometers and individuals not trained to assess the impact of the contraction velocity. In addition, the results of these studies hamper their reproduction in resistance training routines using free-weights exercises, which shows a practical limitation for the trained population. Ide et al10 were pioneers investigating the influence of contraction velocity in a resistance training bout with free weights exercises for lower limbs in resistance-trained men, equalizing the volume by the number of repetitions maximum (RM). The authors noted that the fast contraction velocity resulted in a higher decrease in maximum strength and muscle power (1RM and horizontal jump test) in a longer periods of time post-exercise; suggesting a greater magnitude of muscle damage from fast contraction velocity than slow contraction velocity. Nevertheless, the total volume of load lifted between groups was not mentioned. The total volume load lifted of a resistance exercise bout, represents the sum of numbers of sets, repetitions and load (sets x repetitions x load [kg]); a variable which effects the acute metabolic responses and the muscle damage17,18. Thus, the purpose of this study was to compare the influence of slow and fast contraction velocities on the total volume of load lifted in a resistance exercise bout with free weights for upper limbs, and analyze the recovery time of the maximum muscle strength post-exercise in resistance-trained men. It was hypothesized that fast contraction velocity would result in a greater volume load lifted in the resistance exercise bout, and would induce a greater damage to the neuromuscular function post-exercise. Sixteen young men, who were experienced in resistance training, participated in the study. They were randomly divided into two groups (n = 8 for each group): fast contraction velocity (FCV) and slow contraction velocity (SCV). The inclusion and exclusion criteria for participation in the study were: a) having at least one year of continuous experience in resistance training; b) being free of any injury which may interfere in the study; c) being familiar with the 1RM test; d) using no nutritional supplements based on creatine and anabolic steroids. All participants completed a health questionnaire and signed an informed consent form after being educated on the experimental protocol of the research. This study was approved by the local Ethics Committee, and it compliant with the legal requirements of the Declaration of Helsinki. During the experimental period, the participants were instructed to take no medication, maintain their regular diet, and to refrain from any exercise outside of the study. The descriptive characteristics of the subjects are presented in table 1. No statistically significant differences between the groups were evident for age (p = 0.648), weight (p = 0.163), height (p = 0.656), 1RM (p = 0.151) or training experience (p = 0.286). In the week prior to the experimental protocol, the one repetition maximum (1RM) test was conducted to determine the maximum muscle strenght (baseline) in the bench press exercise for each participant. After 48 hours, the volunteers executed the research protocol and the total load lifted (sets x repetitions x load [kg]) for each participant was recorded during the exercise bout. The 1RM test was performed at specific times post-exercise: 0 (immediately after experimental protocol), 24, 48, 72 and 96 hours for determination of the neuromuscular function. All of the subjects were verbally encouraged to make maximal efforts during the experimental protocol and tests. All exercises included in the research protocol were performed between 17:00 and 19:00 hours PM. The determination of the maximal muscle strength in bench press exercise was evaluated through the 1RM test19. Briefly, the subjects performed a warm up of 2-3 sets of 5-10 repetitions at ~ 40-60% of the estimated 1RM before the protocol. The test was performed with a maximum of five attempts and rest intervals of 3-5 minutes between each attempt. The experimental protocol consisted of bench press and incline bench press exercises, which were performed in 4 sets of 12 repetitions maximum (RM), with 50 seconds rest interval between sets and 2-minute between each exercise. The contraction velocity was 1.5 seconds (~ 0.75 seconds for eccentric and concentric muscle action) for the FCV group, and 6 seconds (~ 3 seconds for eccentric and concentric muscle action) for the SCV group. The control of the contraction velocity was monitored by a beep sound emitted by a pacer, which signaled the end of each repetition and the cadence of movement. Simultaneous verbal instruction was also used to assist with controlling movement pace. Descriptive statistics was used to initially analyze the data. Data normality was evaluated using the Shapiro-Wilk test. Then, a two-way analysis of variance (two-way ANOVA) was used to compare the changes in the outcome measures over time between the systems. When a significant interaction effect was obtained, a Tukey post-hoc test was performed to test for multiple comparisons. Independent t-tests were used to compare the load lifted completed by each group. The significance level was set at p< 0.05. Results are shown as mean and standard deviation (± SD). Values of 1RM test decrease significantly (p < 0.05) only at moment 0 hours (-16%) for the SCV group, when compared with the baseline values. The FCV showed a significant decrease (p < 0.05) in 1RM test values at 0 (-19%) and 24 hours (-8%) compared with baseline values. When comparing the values of 1RM test between groups (SCV and FCV), it was observed a significant difference (p > 0,05) at 24 hours post-exercise. 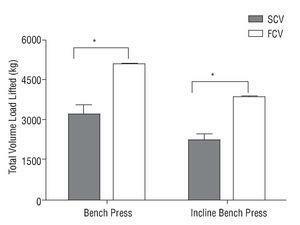 Figure 1 presentes the change in normalized 1RM bench press. Fig. 1. Changes in the normalized one repetition maximum (1RM) bench press test at the following times: baseline, 0, 24, 48, 72 and 96 hours post-exercise. The data are expressed as the mean ± SD by percentage (%) change from the baseline values for the slow contraction velocity (SCV) and fast contraction velocity (FCV) groups. (a) significant difference (p < 0.05) compared with the baseline values for the FEV group; (b) significant difference (p < 0.05) compared with baseline values for SEV group. (c) significant difference (p < 0.05) between groups. The total volume of load lifted (sets x repetitions x load [kg]) in the bench press exercise was 5069 ± 73 kg for the FCV group and 3192 ± 830 kg for the SCV group. In the incline bech press exercise was observed values of 3853 ± 47 kg and 2213 ± 513 Kg for the FCV and SCV groups, respectively. 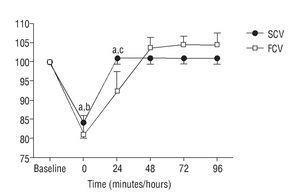 There was a significant difference between groups (p < 0.05) in both exercices (fig. 2). Fig. 2. Values of the total volume load lifted (Kg) in the bench press and incline bench press exercise for slow contraction velocity (SCV) group and fast contraction velocity (FCV) group. * significant difference (p < 0.05) between groups. Data expressed as mean ± SD. The main findings of the present study were; a) the slow contraction velocity significantly yielded (p < 0.05) a lower total volume of load lifted (sets x repetitions x load [kg]), compared with fast contraction velocity in both exercises analyzed (fig. 2); and b) the magnitude of decrease of neuromuscular function was significantly higher (p < 0.05) for the fast contraction velocity when compared with slow contraction velocity (fig. 1). Thus, confirming the hypothesis of this study. The manipulation of contraction velocity directly affects the time that the muscles (involved in the performance of the exercise) remain under tension. In this sense, Chapman et al8 used the method time under tension to equalize the volume of eccentric isokinetic exercise between fast and slow velocities in untrained men. During the exercise bout, the fast eccentric group performed 35 sets with 6 repetitions, while slow velocity group performed only 5 sets with 6 repetitions. Chapman et al8 results showed that the fast eccentric exercise bout resulted in greater magnitude of muscle damage. However, it was unclear whether the differences resulted from the eccentric velocity, because the number of repetitions and total work in the isokinetic exercise differed between the groups. Presenting different results, Barroso et al16 observed no significant difference on the muscle damage between fast and slow eccentric velocity, performed in untrained men when the total volume of repetitions and work in an isokinetic exercice was not different between groups. Studies by Uchida et al17 and Charro et al20 compared the magnitude of muscle damage post free weights exercises performed with differents intensity and methods of training in men with experienced in resistance training. The results in both studies suggest that the magnitude of muscle damage markers were not significantly different, when the total volume of load lifted in free weight exercise bout was matched. In the present study, the training intensity was equalized by the number of repetitions maximum (12RM) per set for both groups, the only difference found between the two groups was the contraction velocity, which was four times higher in the SCV group (6 seconds) than in the FCV group (1.5 seconds). Consequently, the SCV group worked with 72 seconds of time under muscle tension per set, totaling 720 seconds for the performance of the whole exercise bout, while, FCV group worked only 18 seconds of time under muscle tension per set, totaling 180 seconds for the performance of the whole exercise bout. However, to maintain the intensity and the volume of 12RM, the weight of the bar was adjusted between sets, so that volunteers could completed the proposed zone of RM. Fact that favored for the SCV group a significant metabolic demand and declines in the muscular performance over the sets in both exercises (bench press and incline bench press), thereby resulting in a lower total volume of load lifted (fig. 2). Our data corroborate with the ones observed by Ide et al10, where fast contraction velocity induces a greater decline in neuromuscular performance post free weight exercises compared with slow contraction velocity in resistance-trained men. However, the total volume load that was performed by the groups was not reported in the study by Ide et al. (2011). In conclusion, the results of this study demonstrate that fast contraction velocity yielded a greater volume of load lifted during resistance training bout, resulting in a significant loss of muscle strength post-exercise for upper limbs performed by resistance-trained men. These data suggest that besides the contraction velocity, the total load lifted determines the decline of neuromuscular function. Therefore, the total load lifted should be considered when designing a resistance-training program for trained men. We gratefully acknowledge the subjects who dedicated a great deal of time to participate in this study. Master in Physical Education - FACIS-UNIMEP Campus. Taquaral Rodovia do Açúcar, Km 156, s/n. Piracicaba-SP, Brazil. Performance and physiologic to resistance training.. Fundamentals of resistance training: progression and exercise prescription..
Bird SP, Tarpenning KM, Marino FE.. Designing resistance training programmes to enhance muscular fitness: a review of the acute programme variables..
Manipuling resistance training program variables to optimize maximum strength in men: a review.. Muscle damage from eccentric exercise: mechanism, mechanical signs, adaptation and clinical applications..
Exercise-induced muscle damage in humans.. Difference in the magnitude of muscle damage between maximal and submaximal eccentric loading..
Chapman DW, Newton M, Sacco P, Nosaka K.. Greater muscle damage induced by fast versus slow velocity eccentric exercise..
Newton MJ, Morgan GT, Sacco P, Chapman DW, Nosaka K.. Comparison of responses to strenuous eccentric exercise of the elbow flexors between resistance-trained and untrained men..
Ide BN, Leme TC, Lopes CR, Moreira A, Dechechi CJ, Sarraipa MF, et al..
Time course of strength and power recovery after resistance training with different movement velocities..
Bishop PA, Jones E, Woods AK..
Recovery from training: a brief review..
Tissue trauma: the underlying cause of overtraining syndrome? J Strength Cond Res..
Shepstone TN, Tang JE, Dallaire S, Schuenke MD, Staron RS, Phillips SM..
Short-term high- vs. Low-velocity isokinetic lengthening training results in greater hypertrophy of the elbow flexors in young men..
Chapman DW, Newton MJ, McGuigan MR, Nosaka K..
Effect of slow-velocity lengthening contractions on muscle damage induced by fast-velocity lengthening contractions..
Paddon-Jones D, Keech A, Lonergan A, Abermethy P.. Differential expression of muscle damage in humans fallowing acute fast and slow velocity eccentric exercise..
Barroso R, Roschel H, Ugrinowitsch C, Araújo R, Nosaka K, Tricoli V..
Effect of eccentric contraction velocity on muscle damage in repeated bouts of elbow flexor exercise..
Uchida MC, Nosaka K, Ugrinowitsch C, Yamashita A, Martins EJr, Moriscot AS, et al..
Effect of bench press exercise intensity on muscle soreness and inflammatory mediators..
Uchida CM, Crewther BT, Ugrinowitsch C, Bacurau RFR, Mariscot AS, Aoki MS..
Hormonal responses to different resistance exercise schemes of simi-liar total volume..
ASEP Procedures recommendation I: Accurate assessment of muscular strength and power..
Charro MA, Aoki MS, Nosaka K, Foschini D Jr, Figueira A, Bacurau RF.. Comparison between multiple sets and half-pyramid resistance exercise bouts for the muscle damage profile..